Many companies today face a multitude of challenges. One of them is the liability and danger that is created by vandalism and theft. Iron Security Services provides the experience and aptitude of security consultants that have decades of experience in the security industry. We consult with our clients to find the most cost effective solution minimizing their liability and protecting our client’s assets. With our consultative approach we team up with our clients tailoring the right solution. It may include one security officer or a large team of security officers. Iron Security Services Company differentiates itself by understanding our client’s security needs and training our security team accordingly. 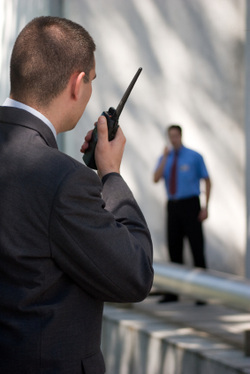 Our security team is courteous, reliable, well groomed and educated. We continuously coach our staff to prepare them for the many challenges our client’s businesses may face on a daily basis. Their skills include providing uniformed patrol services for loss prevention or vandalism protection, reception security, access control, conflict resolution and much more. Our management team is available to our clients 24 hours a day constantly seeking feedback to surpass our client’s expectations and enhance the security of their business. Additionally we consistently visit our client’s business to reassess the best solution for their security needs and to provide additional coaching to our staff. We feel that being part of our client’s team will improve their sense of security and provide them with the necessary peace of mind to focus on their core business. Being available and present improves communication with our clients and helps providing unsurpassed pro-active security solutions. Our appearance will depend on our client’s needs. From plain professional dress to uniforms or suits and ties we provide the right solution to blend in or stand out effectively enhancing our client’s security and the professional image of their business. Copyright © 2018 Iron Security Services Company, Inc. All Rights Reserved.